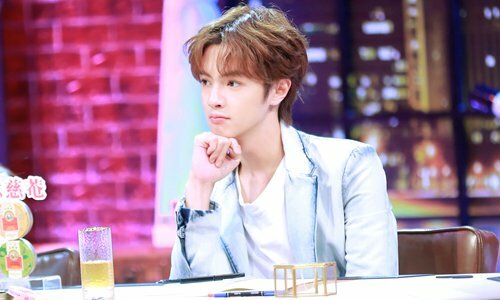 Many netizens took to social media to complain about the recent "feminine-men" (men whose grooming habits, such as wearing makeup, and dress make them look more feminine) trend that seems to have been taking hold in China, especially in entertainment circles. "These stars set a bad example. I'm afraid they will exert a bad influence on middle school students," posted netizen Aiyong999 on Sina Weibo. Other netizens, however, said that people should be more understanding when it comes to today's youth. "I think it is perfectly reasonable for men to adhere to different standards of beauty in different eras. What really matters is that men should be responsible, courageous and insightful," commented netizen Nuolafu-NorahZ. There were also numerous netizens who simply praised the stars for being handsome and cute. This recent trend toward attractive male stars that veer from traditional masculine beauty reflects the changes aesthetic standards of today's Chinese youth have undergone, partly influenced by the "Korean Wave" from South Korea. In recent years, as contact between China and South Korea has increased, South Korean stars, TV series, cosmetics, fashion and other cultural products have increased in popularity. Looking at the young spokesmen for The First Lesson, such as Chinese actor Guan Hong, their fashion sense has clearly been influenced by this Korean wave. South Korean culture is extremely popular among adolescents in China, many of whom chase after idols who blur the line when it comes to traditional masculine and feminine standards of beauty, invoking concerns about whether this phenomenon will become mainstream culture in China and have a negative influence on the next generation. However, according to Sun Jiashan from the Chinese National Academy of Arts, parents needn't worry. While adolescents tend to look at stars as role models while they are still developing psychologically and physiologically, this passion gradually fades away after puberty. For example, from the Wei Dynasty (220-265) to the beginning of the Sui Dynasty (581-618), wearing makeup to look more attractive was considered trendy among the noble class. However, this trend was never adopted by a majority of Chinese. Similarly, while love for feminine-looking male idols is sure to continue today, this standard will not become part of mainstream culture in China.